The people presented in this book are as varied as their signatures. Some were religious, some secular; some made their mark in science, others in humanities. Despite their diverse roots, they all shared a common goal: to advance the Jewish name, the Jewish people, and the Jewish cause. Lutske has grouped these personalities into nine categories: Sages and Saints, including the Baal Shem Tov, Moshe Feinstein, Abraham Isaac Kook, and the Lubavitcher Rebbe; Scientists, including Albert Einstein, Sigmund Freud, and Dr. Bela Schick; Scholars and Philosophers, including Simon Dubnow, Abraham Joshua Heschel, Mordecai Kaplan, and Solomon Schechter; Zionists, including Theodor Herzl, Menachem Begin, Abba Eban, Levi Eshkol, and Golda Meir; Literary Figures, including S. Y. Agnon, Chaim Nachman Bialik, Emma Lazarus, Isaac Bashevis Singer, and Elie Wiesel; Americans, including Bernard Baruch, Louis D. Brandeis, Benjamin Cardozo, Felix Frankfurter, and Jacob Schiff; One of a Kind, including Eliezer Ben-Yehuda, Marc Chagall, Eli Cohen, Alfred Dreyfus, and Sir Moses Montefiore; Holocaust Voices, including Anne Frank, Simon Wiesenthal, and Hannah Senesch; and the Signers of the Israeli Declaration of Independence, including David Ben-Gurion, Tzvi Luria, Golda Meir, and Abraham Katznelson. Each entry is accompanied by a reproduction of the original autograph, or writing sample, of the personality, an epigraph by or about the personality, and a biography highlighting the accomplishments of each personality. The reader will learn not only about those who made history but also about history itself. 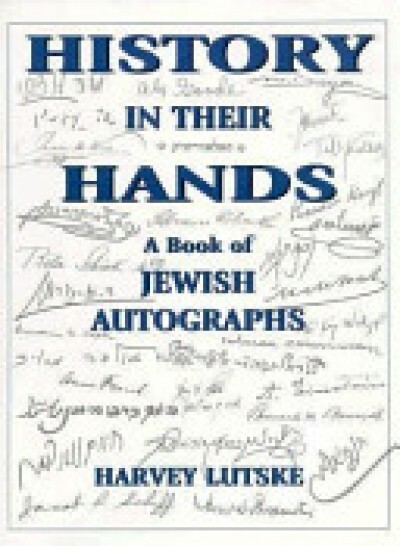 This book includes autographs, letters, and manuscripts in Hebrew, English, Yiddish, French, German, and Russian.